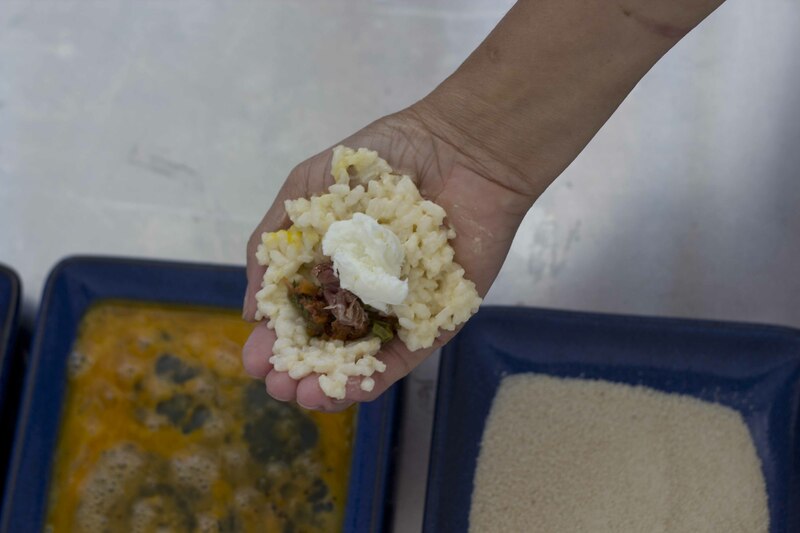 Everyone loves these rice fritters. Miniature versions served on cocktail sticks of these are perfect for parties. 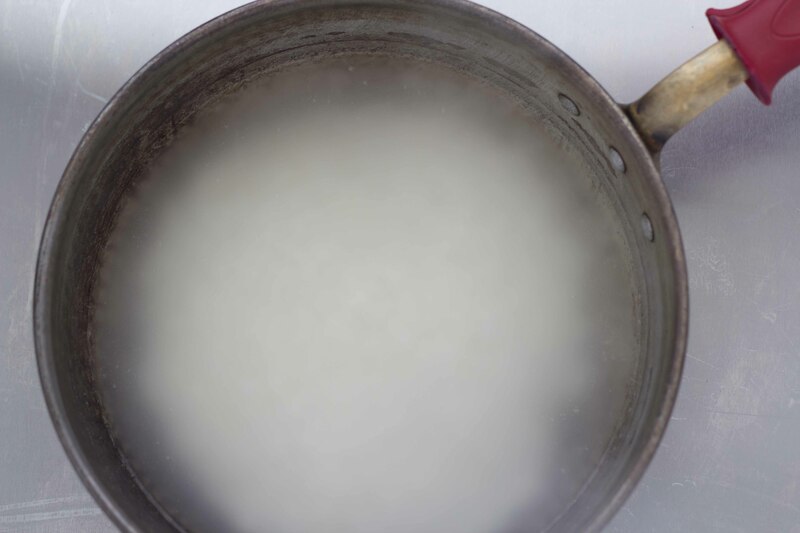 Bring the water to a boil with 2 teaspoons of salt over high heat. Add the rice, reduce the heat to low. 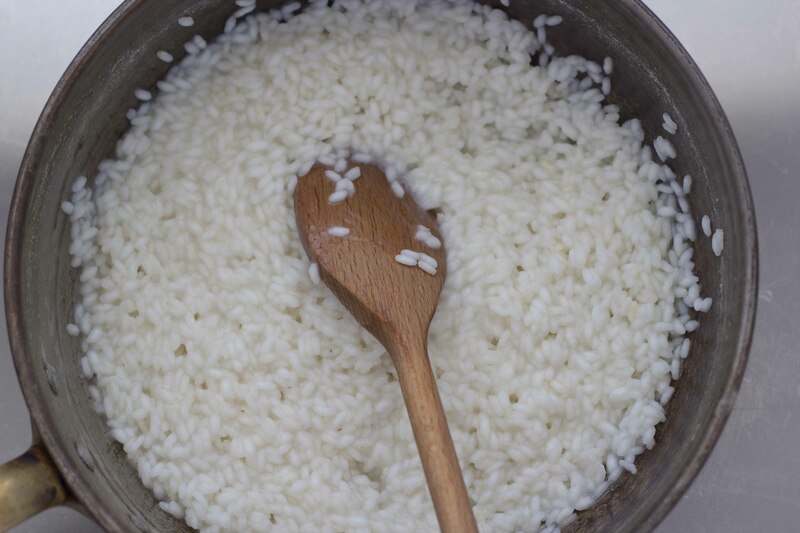 Stir the rice occasionally until all the water is absorbed, about 20 minutes. 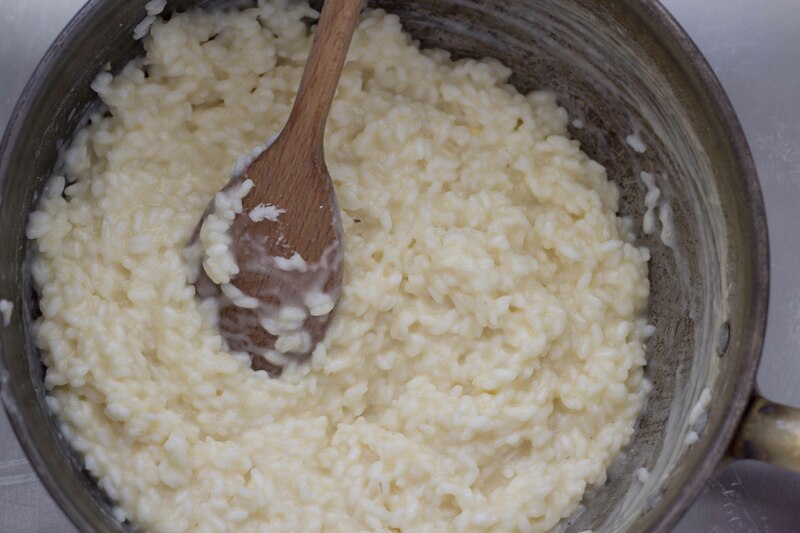 While the rice is cooking, heat 25 grams of butter with 15 mls of olive oil over medium heat. 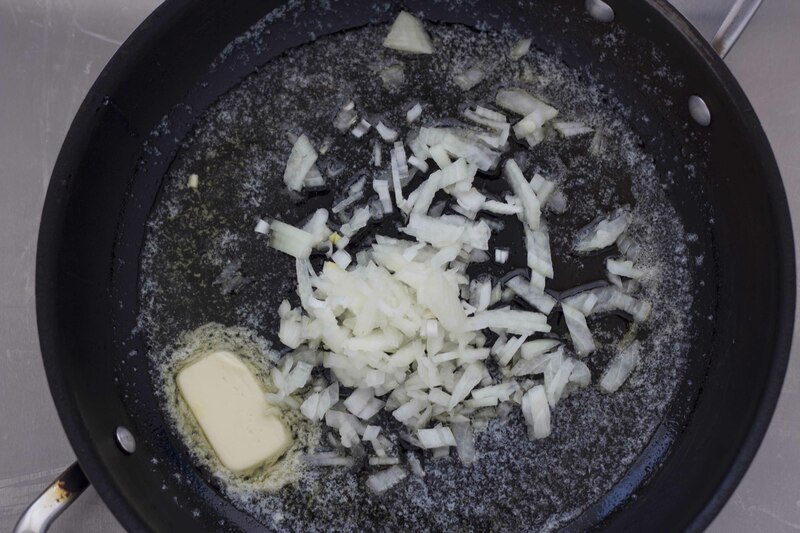 Add the onion to the butter. 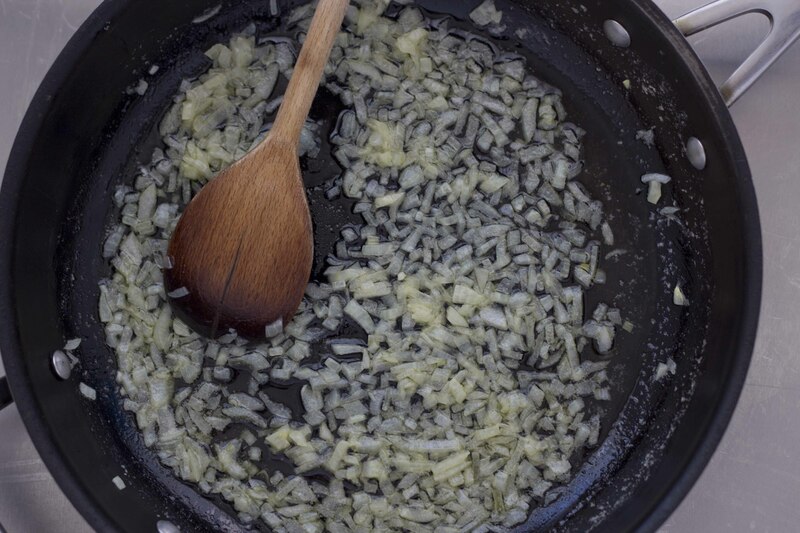 Sauté the onion until soft (about 5 minutes). Add the meat to the onion. 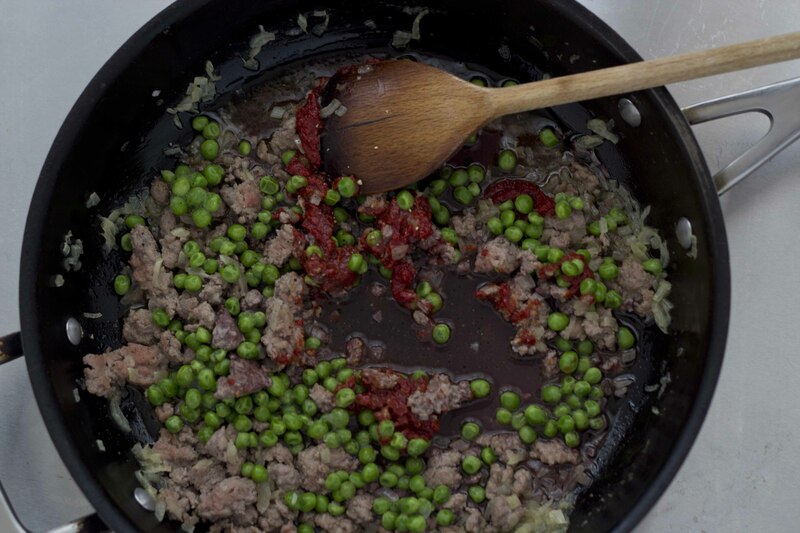 Then add the peas, tomato paste, red wine, parsley, salt and pepper to taste. 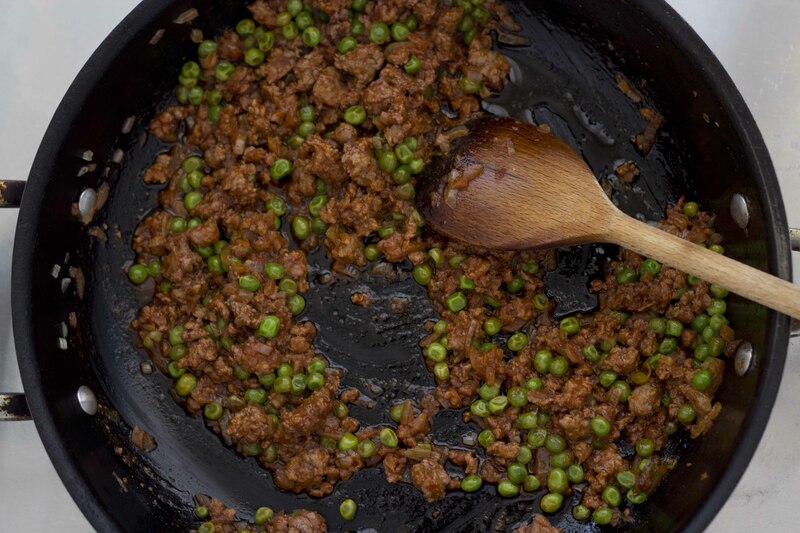 Cook the mixture until done, about 10 minutes. Let cool. 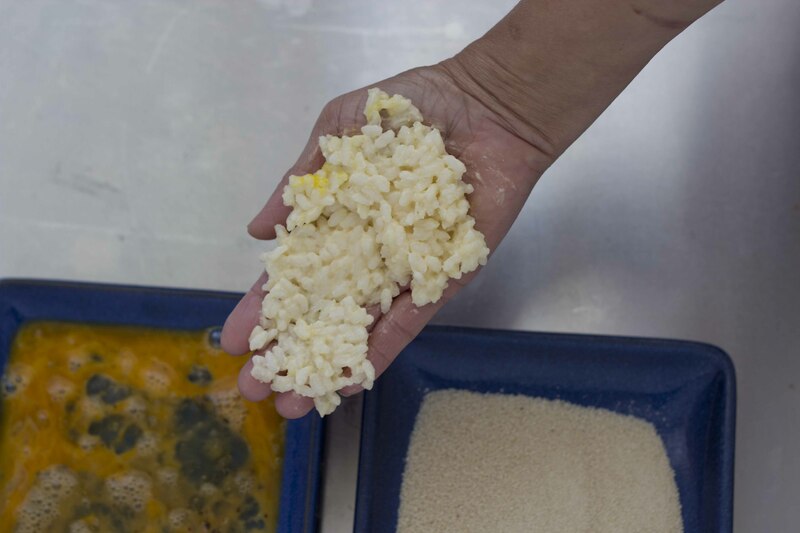 When the rice is done cooking, remove from the heat and add the saffron, 50 grams of butter, 1 egg beaten and the Parmigiano-Reggiano cheese. 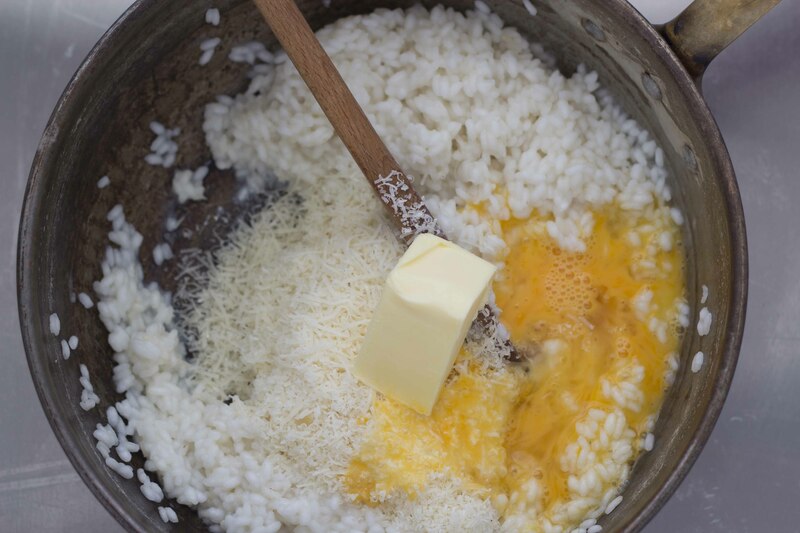 Mix the rice with the butter and egg until well incorporated. 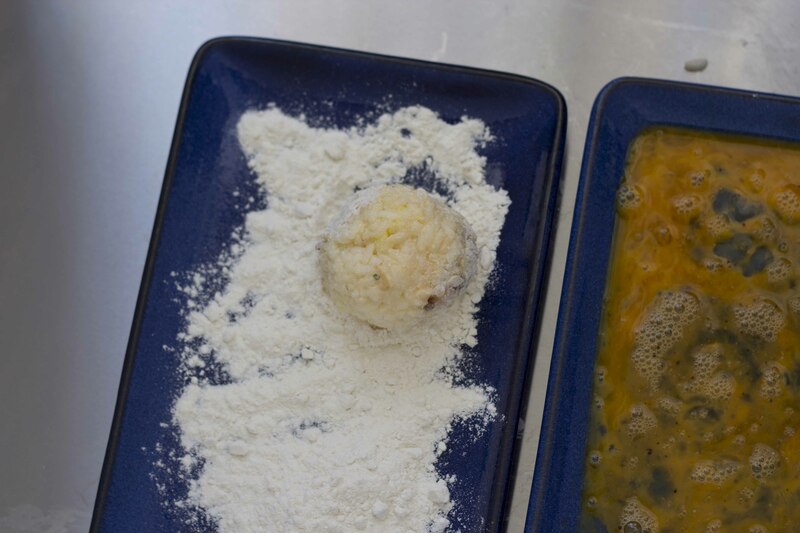 Take 3 plates and put flour on one plate, 2 beaten eggs on the next plate with salt and pepper, and the breadcrumbs on the third plate. 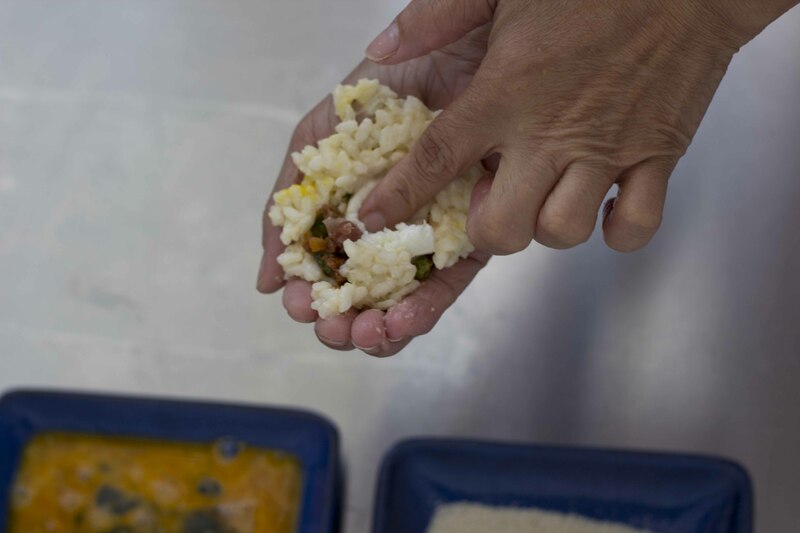 Wet a hand and take a spoonful of the rice and smear it across the palm of the hand and fingers. 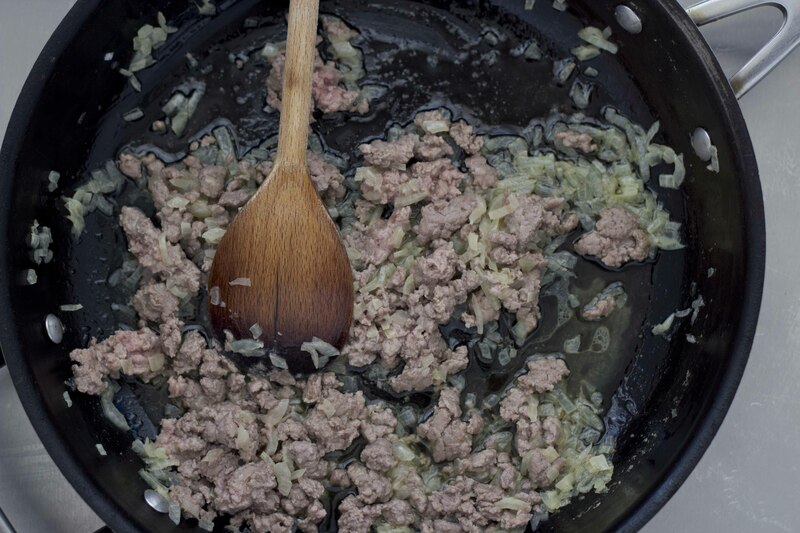 Take a spoonful of the meat sauce and put it in the centre of the rice. 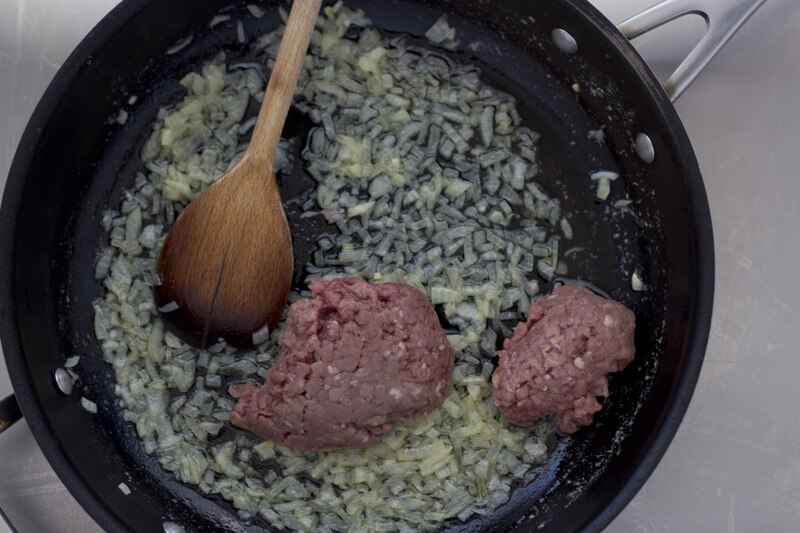 Put a few pieces of the prosciutto and one piece of mozzarella in with the meat sauce, pressing in while folding your hand over the meat and cheese mixture. 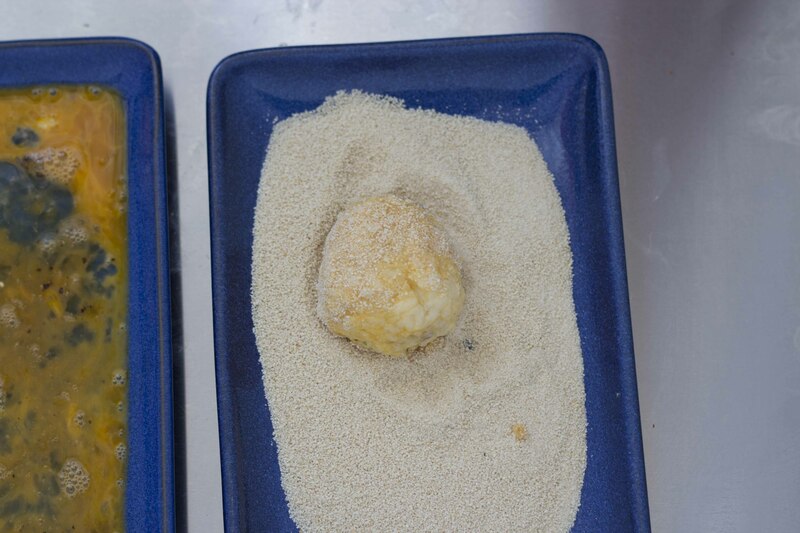 Close your hand around the mixture, pressing and rolling to create a ball about the size of a plum. 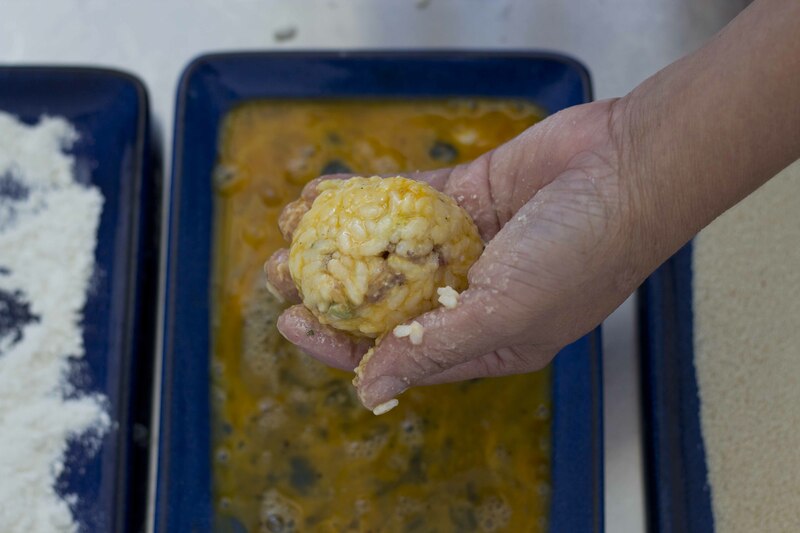 Roll the ball around between the hands to ensure they are evenly formed. Repeat until all the rice and filling are finished. 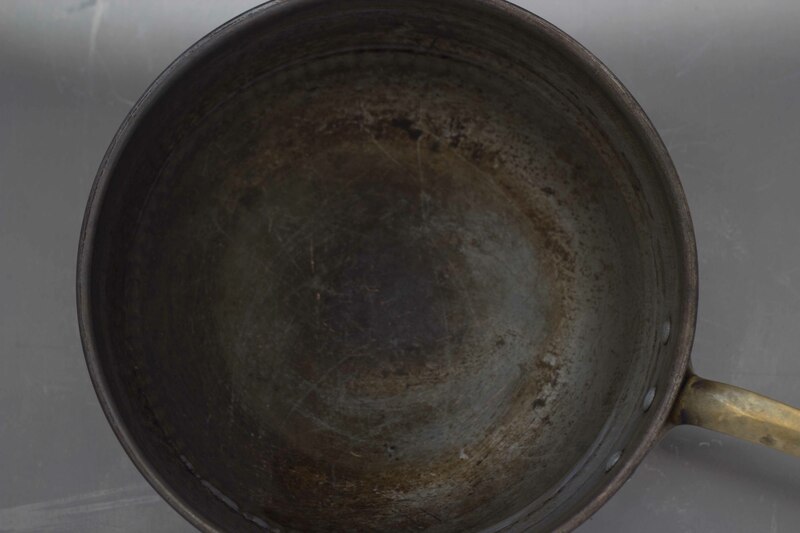 Pour 500 mls of olive oil into a saucepan so that it is at least 1 inch deep and begin to heat over medium heat. 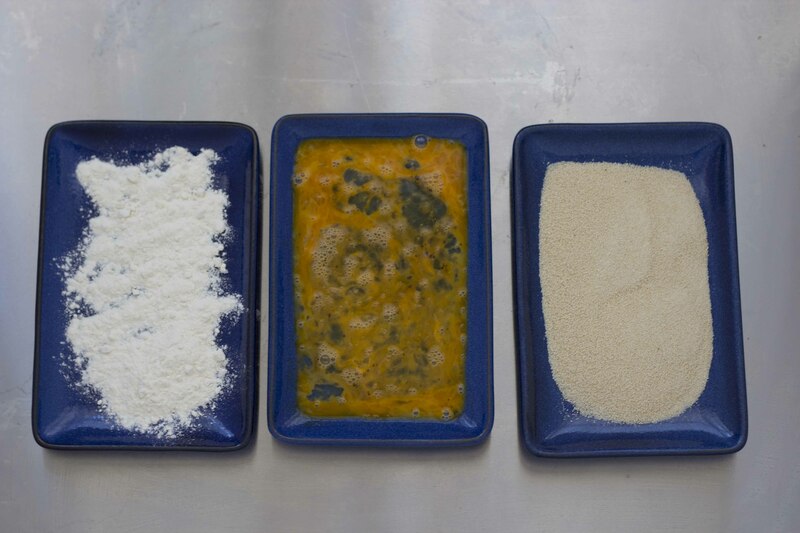 While the olive oil is heating, roll 3 or 4 fritters first in flour. Next roll the fritters around in the beaten eggs. 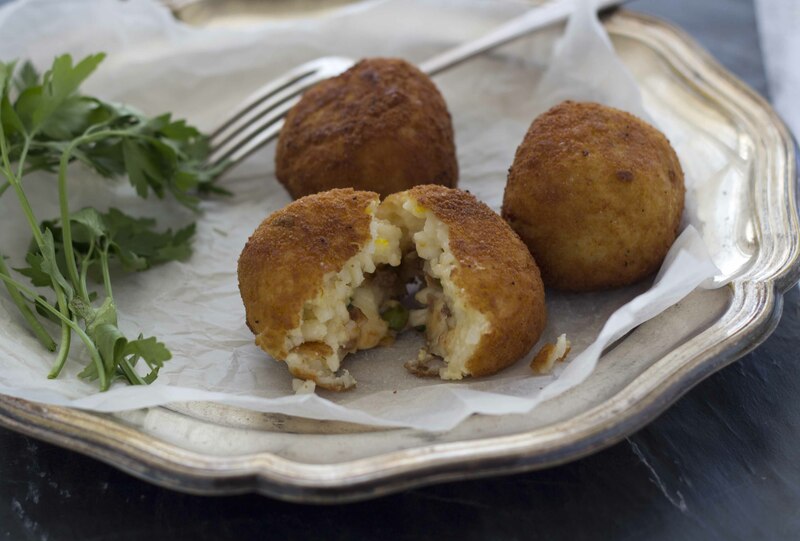 Finally roll the fritters around in the breadcrumbs, pressing the breadcrumbs in so they stick. 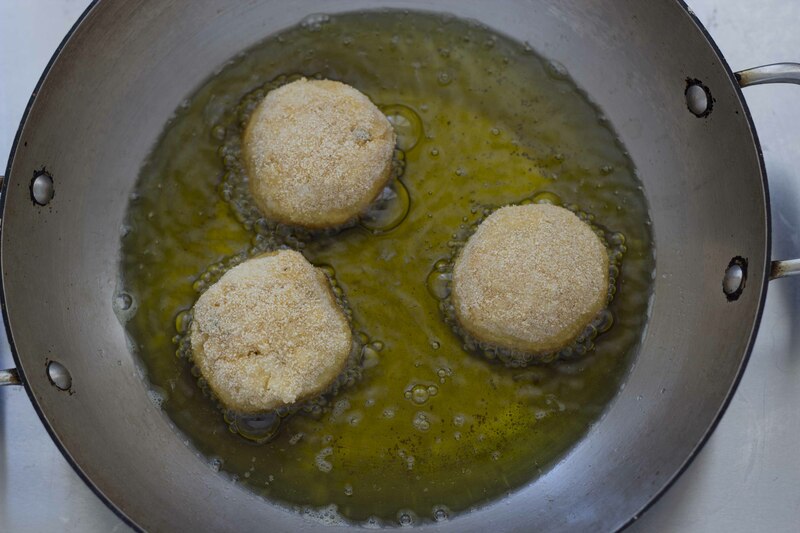 Sprinkle some breadcrumbs into the oil and if it fries violently immediately (the oil should not be smoking), then add the balls to the oil. 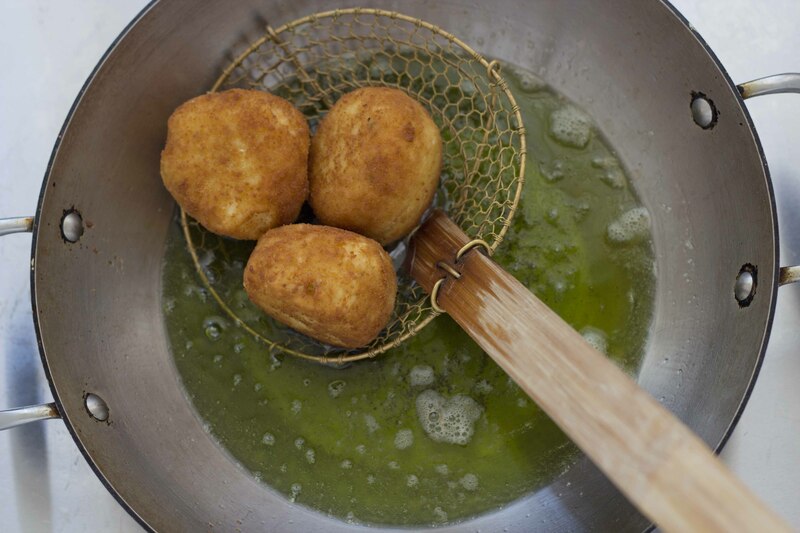 Do not be tempted to add the fritters before the oil is properly hot or they will soak up the oil and not be nice, light, and crispy. When the bottom half of the fritters is a nice brown colour then turn it over until the whole fritters is a nice brown colour. 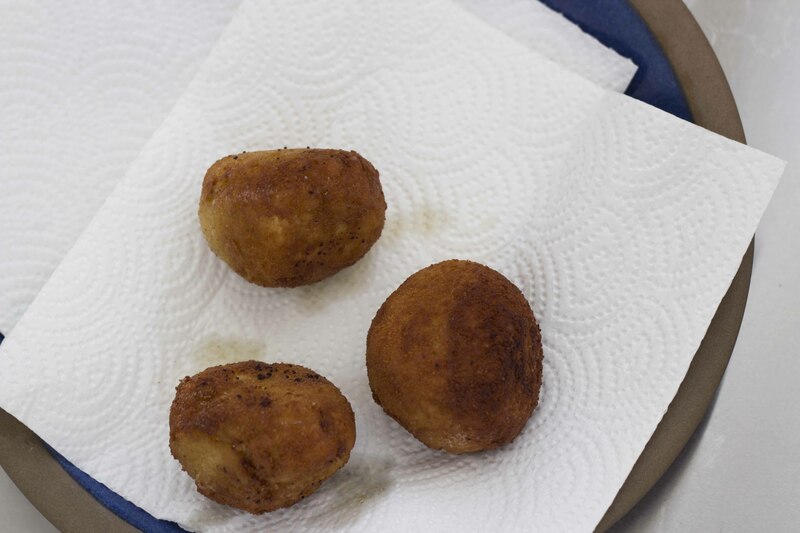 Remove the fritters with a slotted spoon for a few minutes to cool. 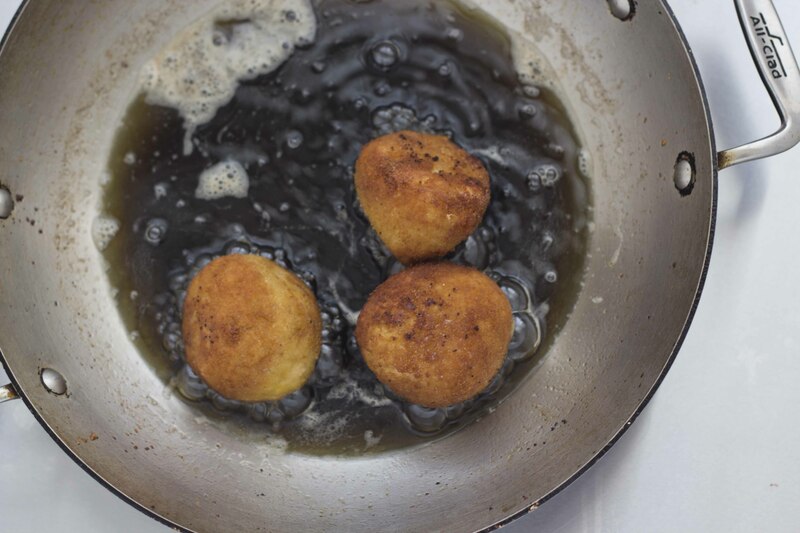 Add the fritters back to the oil to fry a second time. 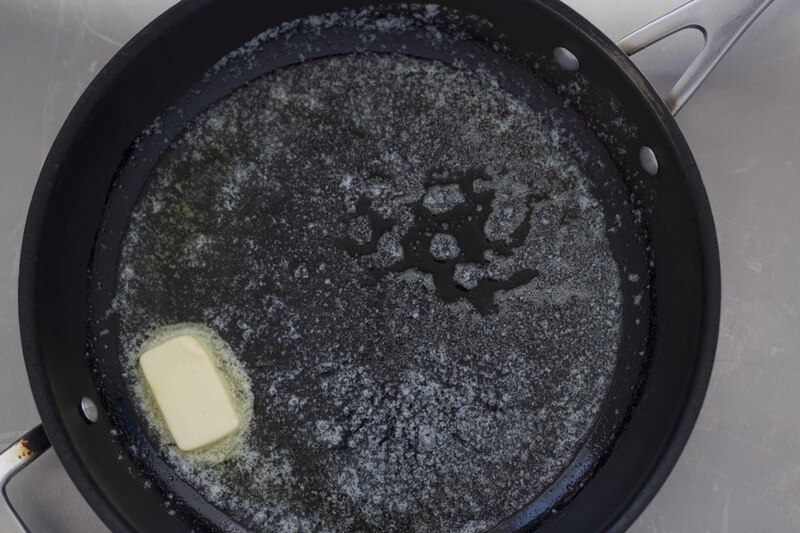 Once the fritters are a deep golden brown, remove them with the slotted spoon to a plate lined with paper towels to drain the excess oil. Serve hot. If you are doing these for a party, you can make them smaller and then reheat on a tray in the oven before serving if time does not allow to make them fresh.